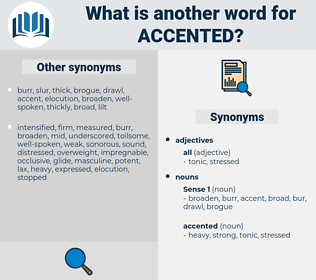 What is another word for accented? 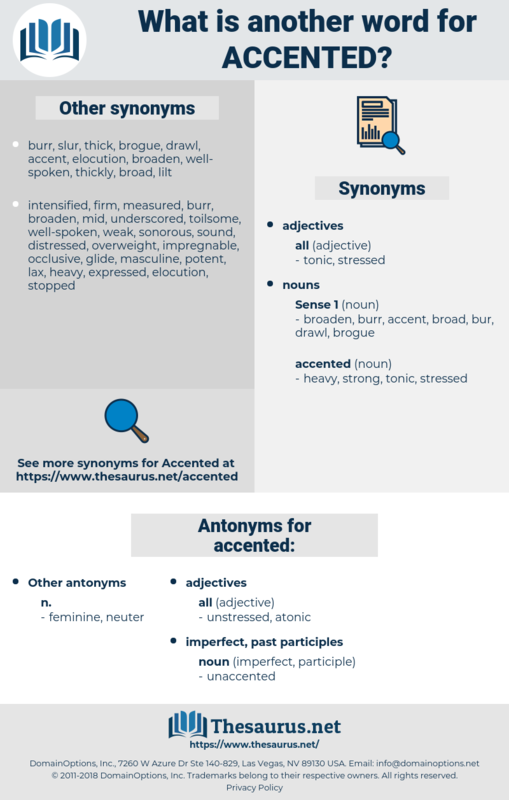 emphasised, emphasized, decorated, underscored, stressed, highlighted. Like Kaydessa, Menlik spoke a heavily accented English. agnatha, askant, acquainted with, accent, agnate, aconite, agamidae, acquiescent, agamete, account, agony aunt, agenda, accouchement, agamid, asquint, azimuth, assent, acuminate, agonidae, assignment, augmented, agent, augend, as needed, Asininity, assassinate, azoimide, augment, Acantha, assonate, assessment, ashamed, assuagement, acquaint, assonant, accentuate, assassinated, accommodate, acquainted, ascend, acned, aquanaut, assumed, assigned, acanthoid, awakened, ascent.